Will Ray Lewis end up with another Super Bowl ring? 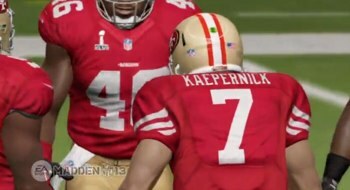 Yes, it's that time of the year again: The time when EA puts its newest Madden to the test and simulates a game between the two Super Bowl contenders. This year sees the San Francisco 49ers face off against the Baltimore Ravens, and if the game is indeed clairvoyant, Ray Lewis will be retiring with a new Super Bowl ring to add to his collection. The official EA simulation of the gridiron showdown put the Ravens on top of the 49ers by a score of 27 to 24. The annual ritual has a bit of a sketchy history, and Madden's prediction of a Super Bowl outcome isn't exactly flawless. Last year, Madden 2012 predicted that the Giants would best the Patriots by the same 27 to 24 margin. The Giants did end up winning, but the score was 21 to 17. Madden 2011 predicted the Steelers would top the Packers 24 to 20, but when the dust settled, the Packers hoisted the Lombardi trophy with a score of 31 to 25. So what are the chances that EA's darling has indeed predicted the correct winner? Well, current Vegas odds favor the 49ers by a few points, so we're not going to bet our house on Ray Lewis and the Ravens crew just yet.